While the next DC Comics movie coming out shows the often tenuous relationship between Batman and Superman, the two generally get along more than they fight. And when they're together, well, they're one of the strongest superhero pairs around, often referred to as the "World's Finest." 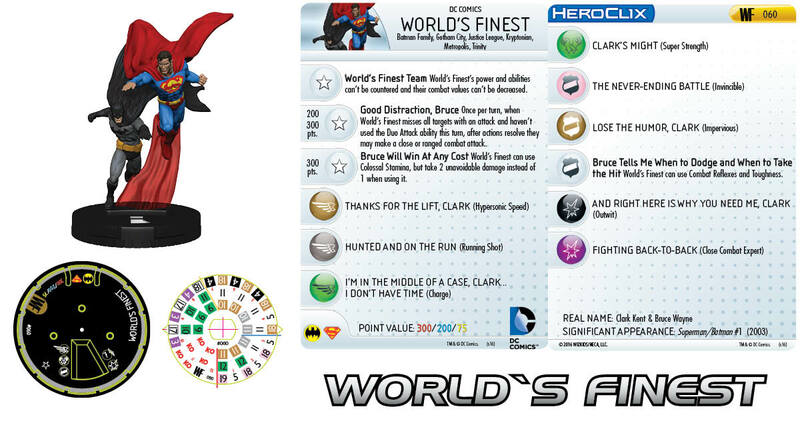 Well, World's Finest is the name of the next DC HeroClix set that WizKids is going to be coming out with. It's also the name of one of the pieces, where you get Batman and Superman both on the same dial. And it's a preview of that which we will look at today. Being two of the most iconic (and powerful) heroes out there, obviously putting the two of them together will create an expensive piece. And yeah, you can plunk this figure down and have that be your 300 points. But you can also play them at 200 or 75, depending on how much of an investment you want to make. They have a couple bonus abilities, if you choose to play them at the higher point levels. So you'll have to weigh that out when deciding if it's worth losing a few other figures on the table. Expect more previews as the release gets ever-closer.